On August 5 Lauren and I made a mad dash down to Mittry Lake after Bobby Wilcox found Arizona’s potential second state record of a Sooty Shearwater and the first one found alive (though see below about a third individual)! With strong winds out of the Gulf of California we had hopes the bird might stick. On the drive down I even had thoughts of the bird arcing over the lake! Unfortunately it did not stick around and was not relocated. 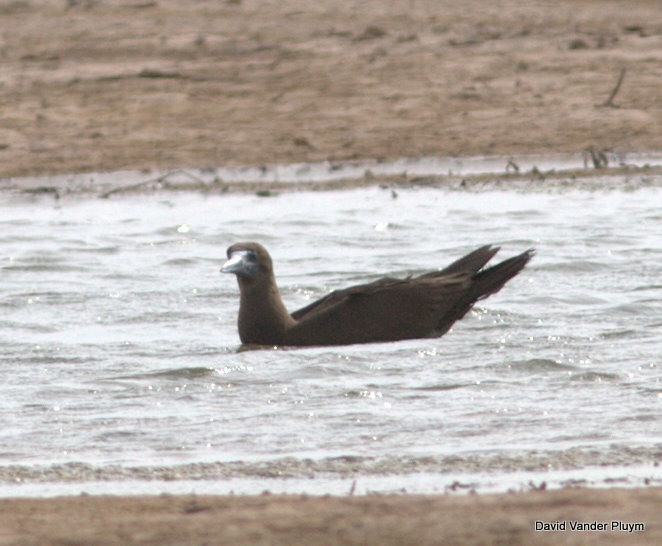 While trying to relocate it, though, I discovered a Brown Booby, which was a nice consolation prize! Though the booby did not stick around long, several of us (Lauren, Henry and Suzanne Detwiler) were present and able to see it. The booby seemed to have just arrived when I found it, decided the water it was on wasn’t deep enough and moved on. 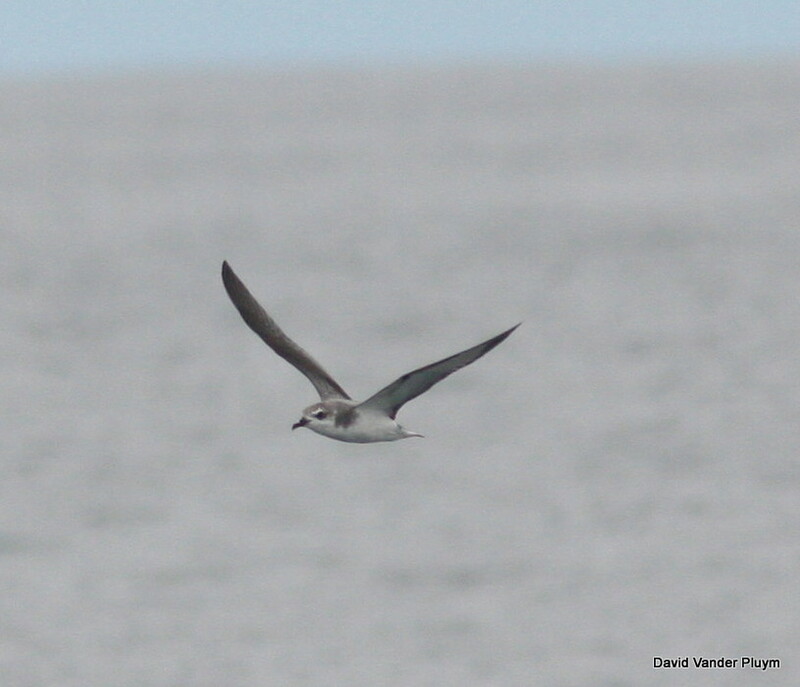 Two rare seabirds arriving in the same area on the same day is amazing, but with no storms about what conditions might have brought them? When one thinks about seabirds in the interior desert southwest one tends to immediately think of tropical storms blowing seabirds up out of the gulf. That has happened with most recently Tropical Storm Nora dumping hundreds of storm petrels on Lake Havasu; see Storm Birding for more info on storm related birds. However these are rare events and most records of seabirds, whether they are tubenoses or boobies, are not related to storms! They do however all follow a pattern. The vast majority come from the “warm season” late April into November with most tubenose records coming from July (late April-September), while boobies and frigatebirds tend to be August-September (mid June-November). 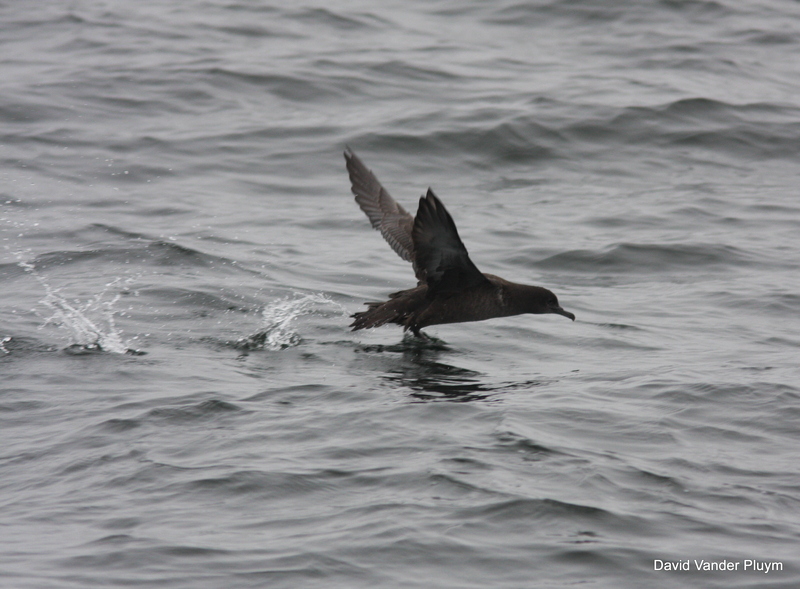 Even Storm-Petrels have been found at the Salton Sea not in association with storms! Interestingly most of the Laysan Albatross records are earlier than the average, from May, a time when they are moving north in the eastern Pacific. So we have a pattern of when, but why do they occur during these times? During the warmer months the temperature difference between the colder Pacific Ocean and the warmer Gulf of California decreases and seabirds that don’t breed in the gulf may move north into it. Once there they may move north up the gulf. Aided by the northward moving monsoonal winds an adventurous bird may ride these winds up the river or into the Salton Sink. In fact when the shearwater and booby were found there were ~10mph winds straight out of the gulf and most records of tubenoses come during such conditions. 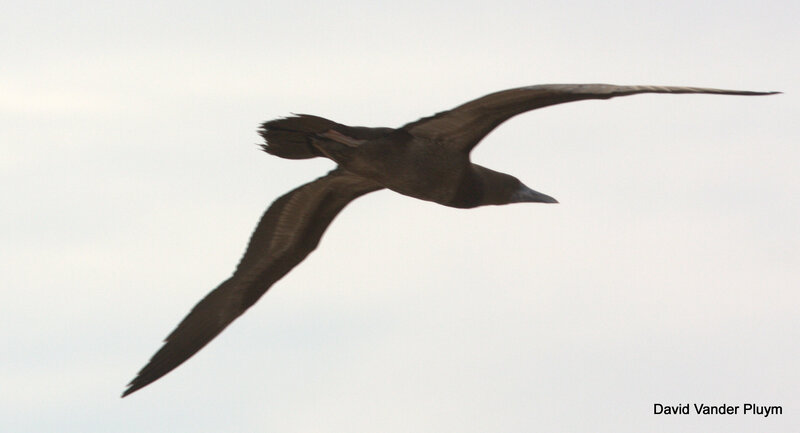 Both boobies and frigatebirds tend to fly higher and can be more readily blown north by these winds, likely the reason there are far more records of these species than of tubenoses. In total 9 species of tubenose have previously been recorded between the Salton Sink (8 species) and the LCRV (6 species). The LCRV had one prior record of Sooty Shearwater, a bird flying along the river at the Palo Verde Dam north of Blythe 19 May 2001, and though not submitted as being in Arizona, must have passed through! The other prior AZ Sooty Shearwater was just outside of the LCRV in Wellton, Yuma County, 6 Jun 1971. 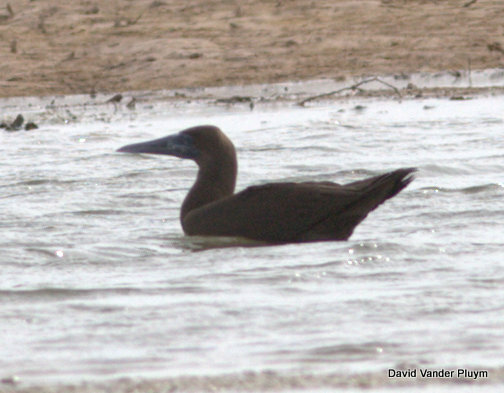 Brown Boobies (and Blue-footed) have occurred more regularly inland, though numbers have decreased since the 80’s with this only being Arizona’s second since 1991! I believe the Salton Sink has also only had 2 Brown Boobies since 1990. Magnificent Frigatebirds were formerly more regular as well and now they are rare enough, that while that is still the most likely species to occur, other species need to be considered and ruled out! Though the focus of this has been on tubenoses, boobies, and frigatebirds, I want to mention a couple other species that could occur in the LCRV because of the summer monsoons. Yellow-footed Gull moves up into the Salton Sink in the hundreds during the monsoons, but despite this there is no record that I am aware of for the LCRV! Laughing Gull and Gull-billed Tern are two other species that could be found at this time of year, and in fact the past several years have had several reports of Laughing Gull. September is the period generally thought of for jaegers, but most records of Pomarine from the Salton Sink are from the summer months. Summer is also a time when numbers of South Polar Skuas have been found in the northern part of the gulf and could ride the winds up the valley or over to the Salton Sea! Though most people bird the LCRV in the cooler months, and the summer can be a bit boring for the birds, the possibilities of a mega keep me going out there even in 122F heat! For more information check out Patten, M. A., et al. 2003. Birds of the Salton Sea: Status, Biogeography, and Ecology and Rosenberg, et al. 1991. Birds of the Lower Colorado River Valley. Also if you can find it (which I have not yet) Patten and Minnich 1997 Souhwest Naturalist. Birder biologists currently living and working in the Lower Colorado River Valley. When not out in the field I spend a lot of my time reading and writing about birds. I have always been drawn to areas under birded and species that we know little about. 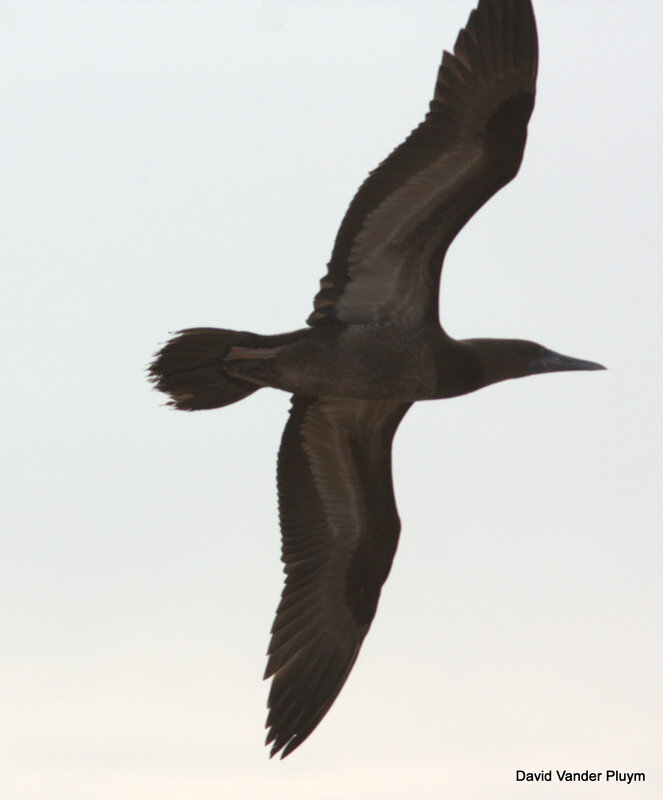 This entry was posted in Imperial County, LCRV, Migration, Vagrants, Yuma County and tagged Brown Booby, Gulf of California, Salton Sink, Seabirds, Sooty Shearwater, Tubenoses. Bookmark the permalink. You provided a wealth of information in this post! Great finds and photos as well! Nine dollars too much? JSTOR has it just tell them Aaron said you could read it for free. It is so good for the rest of us that you and Lauren are out there in the wilderness. I’m sure it’s only matter of time before you and Lauren have some amazing seabirds on Havasu!! Great post! Congrats on the booby!